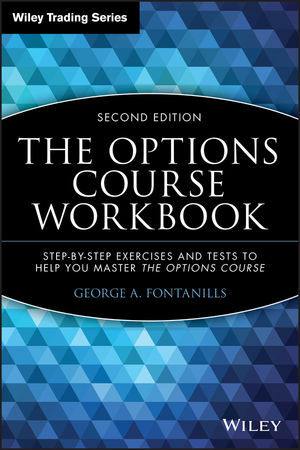 In The Options Course Workbook, Second Edition, George Fontanills offers a wealth of practical exercises that will help further the readers' understanding of options, as well as test and apply what they've learned before they take their first step into the real markets-where time and money are luxuries they cannot afford to lose. This hands-on companion to The Options Course, Second Edition includes a complete answer key and covers a wide range of options issues. GEORGE A. FONTANILLS, who received his MBA from the prestigious Harvard Business School, is the cofounder and President Emeritus of Optionetics, the world leader in options education, with offices around the world specializing in teaching high-profit, low-risk, low-stress options trading strategies (www.optionetics.com). Additionally, George's reputation as "the dean of options trading" has led to numerous guest appearances on television and radio shows across the country. A retired hedge fund manager, he has written and cowritten many books on trading, including Trade Options Online, The Stock Market Course, and The Volatility Course, all published by Wiley. CHAPTER 1: Options Trading: A Primer. CHAPTER 2: The Big Picture. CHAPTER 4: Basic Trading Strategies. CHAPTER 5: Introducing Vertical Spreads. CHAPTER 7: The Other Greeks. CHAPTER 8: Straddles, Strangles, and Synthetics. CHAPTER 9: Advanced Delta Neutral Strategies. CHAPTER 10: Trading Techniques for Range-Bound Markets. CHAPTER 11: Increasing Your Profits with Adjustments. CHAPTER 12: Choosing the Right Broker. CHAPTER 13: Processing Your Trade. CHAPTER 14: Margin and Risk. CHAPTER 15: A Short Course in Economic Analyses. CHAPTER 16: Mastering the Market. CHAPTER 17: How to Spot Explosive Opportunities. CHAPTER 18: Tools of the Trade.